Since the huge success of the Bourne series Matt Damon has become one of Hollywood’s default action stars. The Adjustment Bureau however is not your typical Matt Damon film, not your typical Hollywood blockbuster, not your typical science fiction film but is your typical romance film. Matt Damon plays a young and upcoming politician named David Morris, who is on the verge of being elected as the next senator for New York. A story breaks in the news however and his campaign tumbles, threatening his political credibility and lifespan. A chance meeting with Elise (Emily Blunt) in a men’s bathroom, inspires him to give the speech of his career and reignite his political promise. 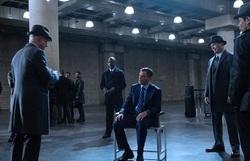 Despite his frequent attempts he is unable to find her again and stumbles upon an organization he was never supposed to be aware of, a group called the adjustment bureau, those who keep everything according to plan and are adamant that he can never see her again. The Adjustment Bureau is a surprisingly old school Hollywood film, it is a science fiction film that is not driven by explosions and huge special effects, but rather the chemistry of its two leads and the strengths of its ideas. The key to the entire film is the relationship between David and Elise, as if that relationship does not work then the whole film falls apart. The film requires us to care about their journey and if Damon and Blunt phoned in their performances and had no chemistry the film would fail. Damon and Blunt however are utterly believable and likable in their roles and carry the film through its rather sudden character shifts. 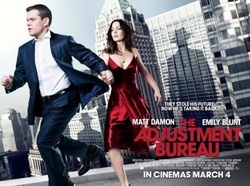 The Adjustment Bureau themselves are an organization that are portrayed as both simple office workers and angels with superpowers. The film can never really decide how it wants to portray these people and is never really keen to delve deep into the characters of the bureau and why they do what they do. One scene involves a character questioning whether their orders are always right but beyond that fleeting moment the motives of those inside the bureau are never explored. If the film had focused on portraying them as simply office folk or “simply” super powered angels, then the portrayal of the titular group would have been much more focused and therefore more effective. The film is very fast moving and there is never a dull moment, however the film moves too fast at times, skipping years and months just to get to a point where the characters want each other again. It is a film rushing to get to the destination and skipping over the journey. The films main “action” set piece involves characters running through doors and therefore as I stated is not your typical sci-action, while this may be a turn off for many action junkies, it is actually the films biggest achievement. The Adjustment Bureau is a science fiction blockbuster that does not include car chases, shoot outs, explosions and lingering shots of Megan Fox but is a film that is thoroughly entertaining without resorting to the typical slam bang action shtick that similar films of this ilk would resort to. The films reluctance to deeply explore its ideas and its swift nature are not the films biggest crimes, instead the sheer predictability of the film and its conclusion, which is the definition of Hollywood cheese, are the films biggest faults. About twenty minutes or less into the film I was honestly able to guess the ending correctly, to see the film play out this way was rather disappointing and this is a film that could easily have had a much darker, more daring ending. The film also has religious echoes that come over as rather heavy handed, with a final voiceover trying to give the film a meaningful message and full stop that the film did not require. Likable leads, an exciting pace and a lack of Hollywood conformity make The Adjustment Bureau an enjoyable film, yet also one that is shallow, predictable and afraid to delve into the depths of its ideas. Disagree with this review? Let us know your thoughts in the Your Say section.